Info "I gotta get to the surface." Dig This is one of Jimmy T.'s microgames in WarioWare: Twisted! The player will be controlling a digger. 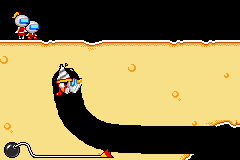 To win the game, the player has to direct the digger to his family on the surface. If done so, he or she will win. However, if they miss, they'll lose. The digger will be blocked by four iron bars in the dirt. 1st level difficulty: Iron bars are not present. 2nd level difficulty: Iron bars are present. 3rd level difficulty: Iron isn't in the dirt at first, but they will appear after a 1/2 second passes. This page was last edited on September 26, 2018, at 20:46.